Thank you to Entangled and NetGalley for a free ARC. All right. Well, I picked this one up because of the Spanish pirate. Of course I'd want to read that. Good premise, but the plot moves along slowly. That's this book's biggest fault. It's SLOW. I wanted more tension. More mystery. I did, however, enjoy the characters. Colette is a little bland, and Donato isn't as pirate-y as I would have liked, but the side characters are fascinating. I liked Colette's brothers, Jordan and Loul, and I would have liked to see more of them. And then Rayna. I'm guessing the author is going to write a third novel with Rayna as the star, and if that's the case, I might give it a shot. We don't see her all that much, but the few times we do, she's COOL. Smart. Dangerous. Ruthless. I liked her. What else can I say? Good job with nautical terms. Not such a good job with the Spanish. I often found myself quoting Inigo Montoya: "I don't think that word means what you think it means…"
I appreciate the historical time period. Yay Peninsular Wars! However, I wanted more more MORE. Not bad. I'm certainly interested in this book's predecessor, which tells Jordan's story, and if there is a Rayna tale on the way, I'll probably check it out. 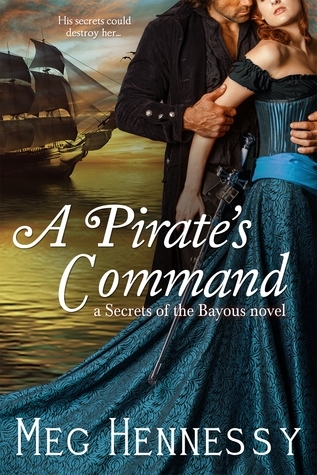 If you're interested, you can find A Pirate's Command on Amazon and Barnes & Noble.